For long we have heard about Internet-of-Things (IoT) and its unique applications and benefits. Over the last one year enterprises have embraced IoT applications or have committed themselves to using these in the time to come. There is no doubt that IoT applications are set to change the way businesses operate and create a remarkable difference in a business’s operations going forward. IoT applications, however, need IoT platforms for their functioning. IoT Platform is the connecting link between the IoT devices and data networks. It is the medium or the base on which applications are created, managed, and run. It is also the place to store, access, and secure data and even run analytics that provide useful and actionable insights from available data. In short – just as an Operating System (OS) is required for a desktop or a laptop, an IoT platform is required for IoT applications. Unlike the scenario in the mobile OS space where Android and iOS control a large share of the market, the IoT platform market space is in its nascent stages and is yet to get consolidated to have very few dominant players. Currently, there are too many players in the IoT platforms market space with both MNCs and Start-ups vying for a share in the market. While big players like Microsoft, IBM, SAP, and Amazon have occupied a fair share of the market, numerous second-rung players and start-ups have been aggressively pursuing potential clients with their offerings. Interestingly, on the industrial front companies like Siemens, Bosch, and GE are themselves looking to foray into IoT platforms. With the aforementioned companies having large business interests and spread across geographies, it comes as no surprise that these MNCs want to venture into IoT platform market space. Given the popularity of IoT concept and its acceptance by various businesses across several industry verticals, the IoT platform market will only witness a congregation of more players even as competition is set to get tighter. Not surprisingly, a lot of start-ups backed by investors are pushing themselves as IoT platforms players to grab the attention of enterprise clients. True to the craze that has IoT has garnered there are platforms of different type and even size. At a broader level, platforms can be differentiated by the industry segment, for example – there are specific IoT platforms for IT companies, Healthcare companies, Real Estate companies, Transportation companies. This makes great sense as the requirements and operations of enterprises change based on industry and function and hence IoT platforms need to be developed on similar lines. At the next level there are IoT platforms based on function such as manufacturing, retail, etc. At a deeper level, there are IoT platforms based on devices such as ones used for augmented reality sets. Going forward, as competition gets intense and more companies foray into IoT platform market space, enterprises will have more choices to choose from. How do you choose an IoT platform? The platform market is getting busier and even more crowded as we speak, but herein comes the confusion for enterprises looking for IoT solutions. It gets very difficult to choose the right platform from so many available options and enterprises can easily be misled into choosing a platform that is not suitable for their requirements. The first and foremost thing to be done before choosing an IoT platform is to clearly understand your company’s IoT strategy. Why do you need the IoT platform and what are you solving through opting for one? Identification of current problems is the first step in the choosing process and based on that you should look for platforms. Also, it’s good to understand what kind of specialization and depth that will be required to help solve the problems and challenges. Applications Capability: The chosen platform should facilitate developing, testing, and maintenance of multiple applications. Of course, this is relevant when you have the need and plan to develop multiple applications. Data Handling and Analysis: It should have the ability to handle and manage high volumes of high speed data that comes from different sources (and devices). Generated data also needs to be combed, captured, processed, and analysed to give actionable insights. The right platform should be able to carry out all of these functions. Owning Infrastructure and Cloud: Many platform providers do not provide the required hardware infrastructure or cloud owing to their capacity and incurring costs. These providers only go with providing the software part of the platform while they depend on bigger players for their cloud infrastructure. Other providers such as Amazon and Microsoft have established cloud services and provide both the software and hardware layers of the platform – your choice of a platform should align with your needs and strategy. Security and Safety: Perhaps the most important of all criteria, data security, and safety is essential. The platform provider may satisfy many suitable criteria but if it has a weak data protection process in place, then everything goes for a waste. Tons of data that are generated need to be protected and platform providers must have in place data encryption and authentication capabilities along with other security requirements. 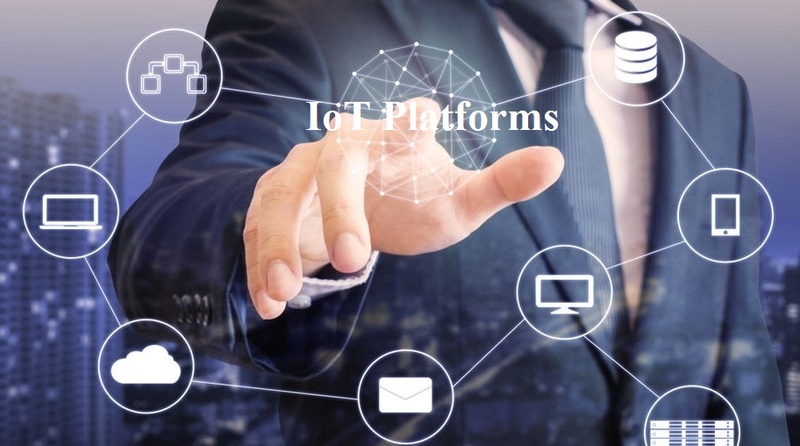 The IoT platform market space is in the nascent stage with multiple players and therefore it is important to not opt for a platform just because it is popular and has been opted for by other enterprises. Platforms need to be chosen solely on your company’s needs, challenges, and problems. Service is of utmost importance, the platform provider should have both the depth of knowledge and service to ensure things run smooth once you have opted for the solution.